Exactly a month has passed since 16/03/08, the day we won the Cheerobics title. Today is our Cheerobics 2008 winning "1 month-versary", also snow's first day of exams (and exactly 7 months to my birthday, a bit out of point, haha). Therefore it is fitting that I commemorate the occasion with a tribute to my dearest partner today, for all her hard work and efforts over the years in helping to make today our "1 month-versary" a reality, and also as an "exam gift" to help her through the exams. It all started out with a cheerleading performance in 2001 with her Sec 4 class. Xuewei and a friend jointly choreograph the routine, getting inspirations from the movie “bring it on”. Being the smallest, she became the top flyer of the routine, and her hardest stunt in the routine being a very modest double thigh stand. Xuewei then moved on to Ngee Ann Poly soon afterwards. With the wonderful experience of cheerleading still fresh in her mind, she went for a very short stint of around 2 weeks with the cheerleading squad in her Poly. She got to try out some harder stunts such as shoulder stand and elevator. Due to her extra classes at night, she could not continue. For the next 3 years, Xuewei took a step back from cheerleading, with her passion for it lying dormant inside her. Then in 2005, she got into NTU. And when she got to know of the cheerleading team in NTU, she decided to give it another go. She managed to ease through the tryouts with her prior experiences and Aces is where she finally got to hone her skills in cheerleading. It started off very well for Xuewei and she got to learn all the basic sets of stunts, including different ways of mounting elevators, extensions, liberties and partner stunting. She got to take part in some cheering assignments, such as cheering for the Army Half Marathon, where she gained valuable exposure. She was also named the “Best Female Cheerleader” during Annual Cheer Training Camp 2005. Their Thai coach also singled her out as a great potential for the future. Xuewei’s cheerleading future was bright and shiny, and at that point of time no one could ever imagine what she would become in a few years time. However, like the fate of many greats before they become who they are, Xuewei suffered a terrible setback at her pinnacle during that time. She fell hard from a liberty and damaged her left knee ligament, just one week after the camp. This was her single worst injury in her cheerleading career. (Also became her trademark of wearing a left knee guard in future on.) It was such a big blow to her and she could not train stunting for months and had to be left out of Cheerobics 2006. But being a very strong and determined girl, Xuewei never gave up; she fought on and after months of physiotherapy and hard training, she managed to recover sufficiently and with her strong pain tolerance, to join her first competition for Aces. She took part in the Cheer Rock Dance Category 2005, where her team came in 1st Runners up. She then performed her dance routine in NTU Sports Expose, her first school dance performance. With further physiotherapy and conditioning, she was only back in full stunt training in May 2006. After she recovered, Xuewei took part in her first full Aces school performance with stunts in the NTU International Student Meet. Then it was soon followed by her first full public performance for The Great Singapore Sale and Toshiba Road Show. After that she was involved in many other performances, gaining more exposure and experience each time. During the same period, she undergone 3 months of intensive trainings during the holidays, Xuewei pick up from where she left as if she was never away. She got to try the toe pitch, such as toe pitch 2-2-1 and toe pitch Swedish falls. She also did her first ever toss back tuck. Then Xuewei went with Aces to Thailand for a training camp. In her 2 weeks training camp, she even got to do her first cupie among all other stunts with Daniel, an ex-all star cheerleader from the states. The 2 weeks was intensive and she got to learn the toe pitch 360, toss pike, pop twist, walk to hands, some basic transitions and lots of different pyramids. Many of her firsts were learned over there, it was really an eye opener and a very fruitful trip for her. Xuewei brought back all that she learned and practiced hard for the remaining of the holidays. Further to that, she also learned the pop front tuck and flybird. (Check out X-Wonder in Training 1) In the midst of the intensive trainings she also helped out the NYGH students and performed for their Gym Fiesta Performance. She was also given more responsibilities to the club by becoming the financial controller of year 06/07. X-Wonder took off after that and came up and tried many new tricks. Many till now were not showcased yet, because of the urge to come up with better ones. Xuewei has now become Aces top flyer and successfully returned from her injury. Everything was very smooth sailing for her then, and she grew from strength to strength. Determination and strong will, was her strength, but also her weakness. She had spent the last 5 months training so hard, completely forgotten that she had just recovered. She was not giving her body ample rest, that her left knee start to show signs of weakness and pain again. Her left knee got injured once more while trying cupie with her inexperienced partner. It was a recurrence of the old injury, and it had to come just 1 week before the Annual Cheer Training Camp 2006, when they got their Thai friends to come down and help again. Xuewei was again very dejected and could only watch as the others trained during this period. She was out of action again till after the exams in December 2006. The recurrence was actually a blessing in disguise for her, as she needed that break, before she embarks on the tough training for Cheerobics 2007. Before Cheerobics 2007, Xuewei also got her IFC Class 1 certificate in Dec 2006, her first coaching credentials. 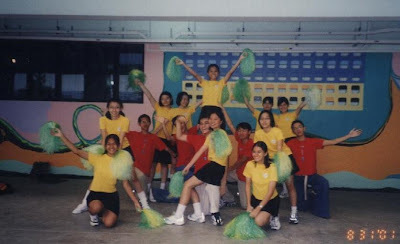 And after that, she went on to co-coach NTU hall 4 in their annual Inter Hall Cheerleading competition in Jan 2007. This was her first taste of coaching. Hall 4 managed to get 5th out of a total of 15 halls. Xuewei got her taste of first live telecast television program on the finals of Super Star Competition. It was a mere 1 min and 30 secs of fame, but the experience and exposure gained was invaluable; no mistakes can be afforded as it was a live show. After this final performance before Cheerobics 2007, she had gathered enough confidence and experience to take on the national stage. The sweat and tears of training for Cheerobics could never be summed up in words. Xuewei had to endure a lot of hardship, tough training, falls and pain. But in summary, she got to master all sorts of difficult stunts and pyramids, most notably front handspring front tuck to Swedish falls and toe pitch gladiator. Her perseverance and determination were rewarded when the team got champions at Cheerobics 2007. She had finally made her mark at the national stage. She will be one to remember and look out for in future. After her efforts at the Cheerobics, Xuewei got to go to Japan to represent Singapore. It was the first time Singapore is sending a team to represent her in the Asia International Cheerleading Competition. What a great honor it was to be representing her country. Just when she thought that winning Cheerobics 2007 was the high point of her career, what she saw in Japan changed her mind completely. She realized from the teams competing in Japan that there is still much more to cheerleading and also much more to get out of her. The trip to Japan proved to be the driving force behind her to continue to motivate her to achieve greater heights and aim for the sky. In May 2007, right after the exams, Xuewei was handed the captaincy of the team for year 07/08, for showing throughout the last year what a great leader, role model and motivator she was. The 3 month holiday training this time round was purely in Singapore, but it was equally as tough. With Xuewei as captain, she made sure that everyone in the team maintained a high level of fitness. She knew that this was a key for improvements. She brought about changes such as running on the track with timing, climbing of stairs, weights training. She led by example and became the fittest of her team, even winning guys in her team. She was nick-named “chicken chop” for her well defined back muscles that always showed when she wore her razor back t-shirt. With her hard and dedicated training in the off-season, together with gymnastics classes at SJI, Xuewei improved further by leaps and bounds. She became the first in Singapore to do a toe pitch full-up 2-2-1 and toe pitch full-up gladiator, and then full-up hands soon followed. She also got to do a standing back tuck on her own. Her aim to become a great toss flyer also brought her to learn the toss layout in SJI. (Check out X-Wonder in Training 2.) It was her determination, her passion, her goal that drives her on, never stopping at each obstacle. It took months of preparation, fitness, body control training and conditioning work to achieve the things that she achieved in this off-season. Aces invited the Taiwan friends they made in Japan to fly down in September 2007 for their annual training camp. With all the foundations in place, Xuewei was able to benefit and learn a lot from the superb bases and fantastic flyers. She got to learn the proper body posture, the right way to control herself while doing stunts, the way to jump etc from the flyers themselves. And she got to try advance stunts such a cupie pop over, liberty tick-tock, full-around, full-up liberty and lots more with the bases from Taiwan. In all the whole experience with the Taiwanese was really like a dream come true and she really benefited not just through looking, but also physically trying out the stunts. Xuewei carried on to train hard and now armed with all her experiences from 30 over performances live, coaching, local and overseas competitions, and guidance from overseas coaches, she was fully equipped to raise herself to another level. Seeing is believing and now there are no limits or boundaries to how far she can go. Tosses such as pike open, pike kick open and twist layouts now seemed attainable by her. Xuewei got her IFC Class 2 certificate in Dec 2007 and became 1 of the 4 only IFC Class 2 certified coaches in Singapore. After getting the IFC Class 2 certificate, she went on to put her coaching skills to the test again. Xuewei again co-coach NTU hall 4 in their annual Inter Hall Cheerleading competition in Jan 2008. Other than coaching hall 4, she also performed in HO with Aces as guest performers, the first time in HO history. They put up a great show and it was also her last performance before Cheerobics 2008. Xuewei trained very hard for Cheerobics 2008. Not only did she improve a lot again this time round, she also helped a lot of new, inexperienced bases hone up their skills. Although she took many falls and injuries during Cheerobics trainings, she held back her tears and went on to put up the show of her cheerleading career. Together with Aces, she put up a routine worthy of setting the standards for many years to come, with Xuewei doing ground breaking tosses in Singapore, such as twist layout and pike out. She also did the only full up 2-2-1 in Singapore during the routine. Xuewei had captained Aces to the champions. Aces and Xuewei will always be remembered as one of the greats in the history of Singapore cheerleading. Xuewei definitely had grown from a fresh fragile little cheerleader into a tough, matured, experienced one. Xuewei is a great player, a great captain, and most importantly, a great cheerleader. The road is still long and unfinished, her legacy lives on. Xuewei is truly a living legend that had grace the cheerleading scenes in Singapore. I've always been impressed by Xue Wei la. She's just besttt. Hee, I started doing this right after cheerobics. Took me very long to look through and sort out hundreds of photos and videos, and typing this 2000 plus words long post. haha. But I guess its all worth it. and thank you Xuewei for being such a great role model.. Cheerleaders aren't born, they're trained.